X-Men has 2 cool features in store. First of all, there is the X-Men Scatter. Get at least 3 of those scatters and you will win 5 times your total bet. If you happen to get 5 X-Men Scatters, you will win 200x your total bet! Next, you will be taken to a new screen to play unlimited free games in the blue-coloured Heroes Mode and 8 free spins in the red-coloured Villains Mode. Watch the Hero and the Villain on the 3rd reel, because they will change the mode you are playing in. They are also Extra Wild symbols during the free spins feature. The second feature is the X-feature, which will be triggered if only hero symbols occupy the positions on reels 2, 3 and 4, taking on the shape of an X. You will win 5 times your total bet when this happens! This feature can only be activated during main play. The Wild Symbol in this slot game substitutes for all symbols, except the scatters, and 5 Wilds will pay out 10,000 coins! This is such a slick-looking slot, quite addictive I must say. And you can already start spinning those reels with a bet as small as € 0.25 when all pay-lines are enabled. X-Men allows high-rollers to wager a maximum of € 1,250 per spin - which happens to be the highest bet among all Marvel slot games! There are 8 coin denominations to choose from, ranging from € 0.01 up to € 5, and you can select up to 10 coins per pay-line. All lines pay from left to right, except the Scatter Symbols which pay in any position. 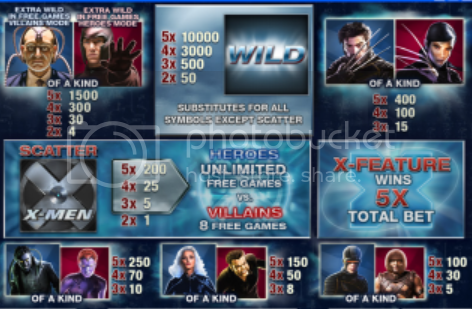 Last but certainly not least: X-men is also linked to 4 progressive, mystery multi-level Jackpots which are randomly triggered: i) the Power Jackpot, ranging from € 50 to € 500, ii) the Extra Power Jackpot, ranging from € 500 to € 5,000, iii) the Super Power Jackpot, ranging from € 5,000 to € 50,000 and iv) the Ultimate Power Jackpot which ranges from € 100,000 to € 1 million! Join X-Men now for some thrilling winnings and start off with a € 4,000 Welcome Bonus at Noble Casino!